It’s the script of my inner dialogue from all the struggling that I endured in the swimming pool, trying to learn how to scuba dive. It’s not that there was no supply of air, but not being to breathe through the nose and to force myself to do it all through the mouth was nerve wracking. Then somewhere along the way, it suddenly clicked like a puzzle that suddenly fits. And from that moment I began to really enjoy myself. 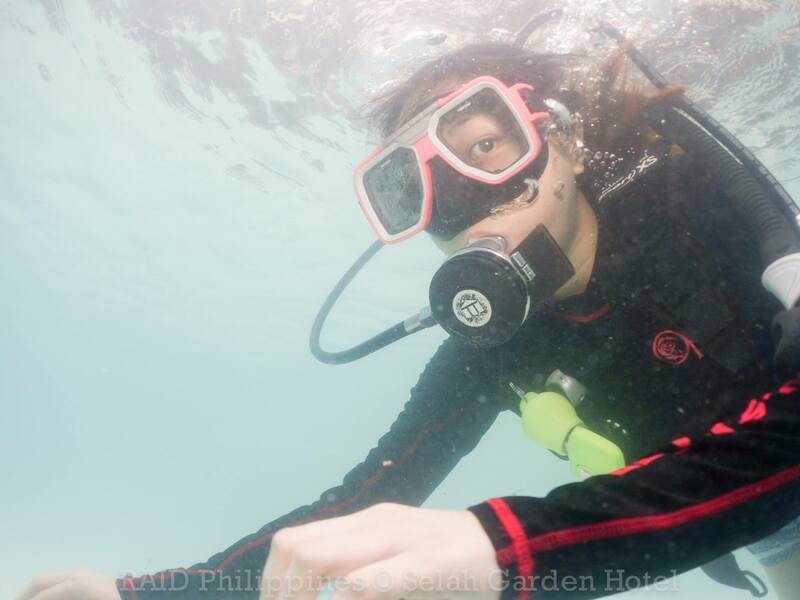 It was my first scuba diving experience and it all happened in the swimming pool of the Selah Garden Hotel. 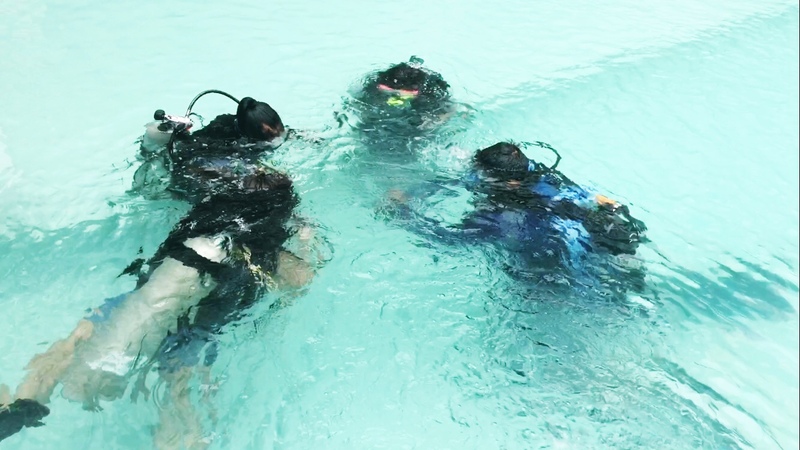 DiveRAID is a dive center-based training agency. RAID stands for Rebreather Association of International Divers and they have dive centers all over the world including the one in Anilao, Batangas. For our diving lesson we were trained by DiveRAID instructors Eric Yee and Christoferou Chan. Before we went to the water, the instructors told us a little background about DiveRAID and prepped us on what we should do and expect while diving. They explained the purpose and use of scuba diving equipment, the two skills that we need to learn in the water, the hand signals, among others. We were then divided into two groups; I was in the first batch with Jon and Jerny. Buoyancy compensator (BC): If you don’t know how to swim, don’t worry, the buoyancy compensator or the vest that you will wear for scuba diving would make you float. BC also makes carrying the tank easier. Fins/Flippers: Worn in the feet and aid movement through the water. Tank: The source of air so you can breathe underwater. Mask & snorkel: Is used so you can see underwater. Regulator: This is what you use to breathe the air from the tank. The most enjoyable, albeit also the most challenging part of it all is of course when we finally went into the water to apply everything that the instructors told us. My past snorkeling experience should have lessened the learning effort—it didn’t. In fact it meant no sh*t as I flailed about, making a fool of myself. And so in the midst of a struggle that in my estimation lasted for about 15 to 20 minutes, I was ready to quit. My chest hurt, I’ve swallowed and snorted pool water, coughed and wheezed, and called out all the saints and angels. Eric, one of our diver instructors seemed to have thought I was worth the effort so he didn’t give up on me. The fact that the water was freezing also made things harder than it already is. I gave up in the middle of the tree-top adventures and I regret it. So this time, despite that voice in my head that was telling me to give up, I pushed through and completed it. I’m sure glad that I did, because when I finally got the hang of it, I honestly found it quite enjoyable that I didn’t want to leave the water. Pretty much what happened when I was first learning to breathe during snorkeling, that’s how I eventually learned to breathe through the regulator. I followed Eric’s advice all throughout, and in the process, I was able to learn two skills; how to take out the water when it gets inside the mask and how to take out the water when it gets through the mouth. I did them a few times before I was able to learn. Just like everything else in life, if you keep going, if you just keep your patience, you will everything learn it. So my advice to you is to definitely try scuba diving if you haven’t yet. I swear it is one of the most memorable and fun experiences you will have in your life. I am now thinking of taking a full course and I want to try to dive in the open sea. Diving in the swimming pool is fun, but it’s not really scuba diving until we take it to the ocean and be with the sea creatures right? 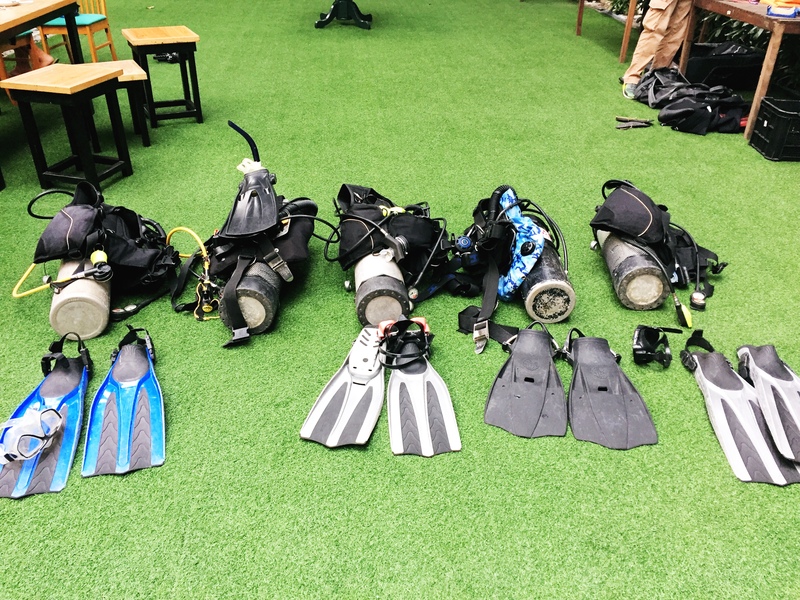 If you are interested to take Try-Dive at Selah Garden Hotel, call them up or send them an email. Refer to the contact information below this post. 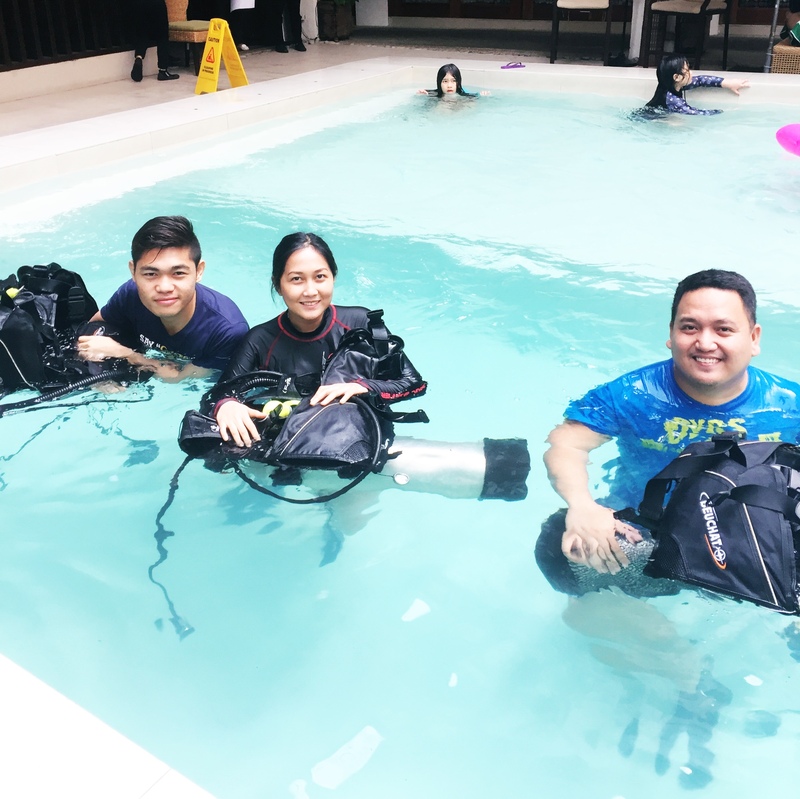 Rate is PHP 2,700 (USD 54.19) per session and if you want a full Try-Dive Course, the rate is PHP 18,000 (USD 361.26) with 4 dives; 2 sessions in the swimming pool and 2 sessions in the open water. Hi Marjorie. As we have planned to go to Selah Garden. I did not know they had this kind of activity. Thank you, but I have a question. I would like to ask, what are the inclusions of 2,700 PHP per sessions. How many minutes does it have? Thanks. I’ll wait for your reply. Hello Kenneth, the rate includes the use of the scuba diving equipment and of course the lesson itself. I can’t recall how long our session is, but I would say it lasted for 2 to 3 hours. I haven’t tried scuba diving and it looks like you had to convince yourself first to go with. 🙂 But i’m glad you did. As for me, I’m not entirely sure if i would do it. If ever I change my mind, I think I would have the same conversation in my head. Haha I have a weird paranoia when I go swimming in the sea. One of my best friends’ parents own a diving school here in Ostend, where you can learn to scuba-dive as well! I tried it a few years ago, but I couldn’t get adjusted to the ‘wierd’ breathing. I always started to panic in a way .. Maybe it’s because I’m a little but claustrophobic? I don’t know! Happy to read you had a great time! Diving is something I would love to try and this is an absolute fun and awesome thing to experience in this lifetime, at least for someone like me who does not know how to swim well. I wish they’d offer this in affordable rates, though, so more people will be encouraged to give it a go. I wasn’t aware that there is actually a hotel who allows Scuba Diving sessions in its own pool. Breathlessness is a paranoia that haunts me when getting underwater and I need to fight it. Woah! It’s so near my place, I think? Hahaha! But, scuba diving has been one of the activities that I really want to try! The fins made me remember my childhood. I have told myself that I want to be a mermaid someday. HAHAHA So I always try to swim like a mermaid whenever there are fins. That are my exact thoughts every time I go scuba diving! Please do share if you try to scuba dive into the open ocean in the future! I can assure you even though you have the fears (because I’ve tried several times but I still get scared), it is still fun and incredible. Still, thank you for sharing this! I’m glad you enjoyed. Parang naiimagine myself saying those lines, lol! I actually can’t swim. My partner was patient enough to teach me pero I gave up. I tried but I’m afraid of deep water. I probably need to learn how to swim first before I try this. Pero once I learned how to, I’d definitely try snorkeling/diving. Hi Abbie, you don’t have to know how to swim to try diving. The BC will make you float. I mentioned this in the article. Actually you have to learn how to swim if you were to scuba dive in the ocean. Just saying. Really? The scuba divers told us that we don’t have to because the BC would make you float anyway plus seawater makes you float too. Hi Sienny, it looks like you didn’t read the article. I am not a scuba diver, I tried diving in a swimming pool, so nope I haven’t seen the underwater world yet. This comment makes me sad. Please don’t be rude to your readers. Correcting something that is in fact in the post is not being rude. In fact, I am frustrated that people nowadays just leave comments just for the sake of commenting. I go to their blog posts and take time to read and understand what they wrote and leave a meaningful comment and this is what I get in return. It’s funny that I love the ocean than the mountains but I don’t give scuba diving a try. Ever since I heard a horror story about the lungs that popped because of going above the water too fast, I got scared. Sometimes I don’t have the patience to stay down under. I prefer skydiving since it’s easier. Well, if you say it should be tried, how long does each session last? Hi Me-an, I don’t think you will surface in the water too fast so don’t worry about it. Each session lasted for an hour, but it will actually depend on how many you are in the group. I’m a professional diver and I can tell you that this only could happen if you hold your breath while you are going up from the depth and the swimming pool in not deep enough to make this happen, but you will see that if you start a diving course, this is one of the first things that they will tell you “DON’T HOLD YOUR BREATH” 😀 And during the course they will tell you millions of times, so don’t worry about this too much. If you life fishes and beautiful nature it’s a must try. Wow, this is truly an awesome experience. I’ve been planning to try scuba diving, but just like you, I have so much inner thoughts that are cynnical and that hinders me to didn’t try until now. I haven’t heard about learning scuba diving in a swimming pool, but just like what you have written, you have just explained all the questions forming inside my head. Anyway, congrats on your scuba diving lesson. May you try it in the wide ocean soon. We can be our own worst enemy but if you do not listen to that negative voice inside your head, you can definitely do it. I don’t know if I’ll ever have the guts to try scuba diving! First of all, I don’t know how to swim, so that’s one. But I’ve tried snorkeling once and it’s really awesome so if given the chance, I might try learning scuba diving too. I’m not sure. I will not worry about it for now and just decide whenever the opportunity comes! lol. Like I said, you don’t have to know how to swim to try scuba diving. The buoyancy compensator will help you float. Your description encourages me to try this out at least once.. I have been always scared of breathlessness. The equipment looks sound and should be safe. Yes it is, it just takes some getting used to but it works and pretty soon you will get to enjoy it. Yes, they are a bit similar as far as breathing through the mouth is concerned. But scuba diving is much more complicated and it will allow you to go deep into the water and see the underwater world up close! I can’t wait to try it to the open sea. Brings back memories agad hahaha… So let’s go na ha, karirin na natin ang diving! Oh wow! I’ve always wanted to try scuba diving but it always ends up as just a plan. Thanks to your blog post, I’m now considering this new Try-dive. Hi Andrew, I hope you get to try it. It’s really fun!